Attorney Hope Whitehead will facilitate a teach-in on jury education on Tuesday, April 17, 2017 from 6:00-7:30 pm. 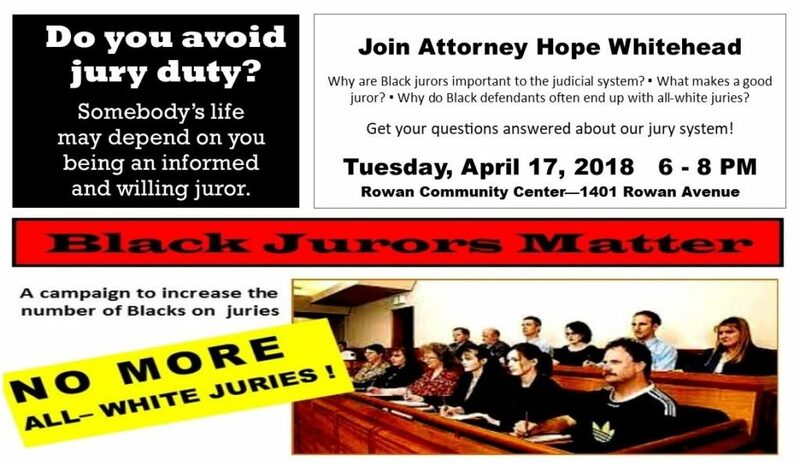 The teach-in is part of OBS’s “Black Jurors Matter” Campaign to increase the numbers of informed and willing African American jurors. The session will be held at the Rowan Community Center, 1401 Rowan Avenue. The teach-in is free and open to the public. Membership meetings are now open to the public! Invite your beautician/barber, coworkers, family, friends, and neighbors! Each month we will have an exciting discussion about various topics. For this month’s meeting our guest speaker was Attorney Hope Whitehead. She gave a very interactive and humorous presentation on how to increase one’s chances of serving on a jury and encouraged attendees to spread their new knowledge.